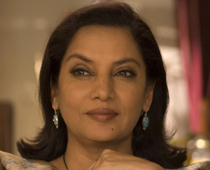 Padma Bhushan awardee Shabana Azmi has been honoured by the city of New York for her contribution to cinema and her involvement with the movie industry here, becoming the first Indian actor to receive the honour from the city. Azmi was presented with a 'Proclamation by the City of New York' honouring her "in recognition of her great contribution to the art of cinema and for her participation with the movie industry in New York City." Azmi, 61, was presented with the proclamation by Patricia Kaufman, Executive Director of Motion Picture and Television Development from the office of New York Governor Andrew Cuomo as well as with a 'Certificate of Special Congressional Recognition' by New York Congresswoman Carolyn Maloney. The proclamation also applauded her work as a social activist, noting that apart from being a "highly respected" advocate for social justice, she has worked tirelessly for other causes, including funding for displaced Kashmiri migrants and relief for victims of the Latur earthquake. "Coming from the city's council in recognition of my work in cinema is obviously something that makes me very happy," Azmi said. The proclamation added that her presence on the board of the arts organisation Indo-American Arts council (IAAC) has inspired hundreds of Indian film makers in the New York area for over a decade. "Shabana Azmi's talent has garnered international acclaim, helping to shape the Indian film industry and build awareness of Indian cinema in North America," Kaufman said at the ceremony here attended by several prominent members of the Indian American community. Describing Azmi as a "woman of extraordinary achievement hailing from a country rich in culture and traditions,"Kaufman extended Cuomo's wishes to her on receiving the honour. Azmi has served as an advisory board member of the annual New York Indian Film Festival, established by the IAAC in 2000. The annual film festival, which brings together feature films and documentaries from and about the Indian subcontinent, will be held this year from May 23 to 27. Azmi lauded the IAAC and its co-founder Aroon Shivdasani for creating a space in North America for Indian and diaspora-related films. "This is the 100th year of Indian cinema and any effort that can be made to strengthen its visibility anywhere in the world is something that I welcome very greatly. "The fact that the New York City Council recognises my work in cinema becomes a means of saying that Indian cinema is what we recognise because I am who I am because of my first primary identity of being an Indian film actor. It becomes a peg on which you can create greater visibility." Azmi fondly recalled her association with New York city, the cosmopolitan character and buzz of which reminds her of Mumbai. She was the only Asian actor to be honoured with a retrospective of her films at the 40th New York Film Festival in 2002. The five-time National Award winner was this year named recipient of the Padma Bhushan, India's third highest civilian award. Azmi has won accolades in India and across the world for her films like Ankur, Arth, Masoom, Godmother and Fire. Her repertoire of international work includes John Schlesinger's Madame Sousatzka, Nicholas Klotz's Bengali Night, Roland Joffe's City of Joy, and Blake Edwards' Son of the Pink Panther. She is currently working on Mira Nair's The Reluctant Fundamentalist. Azmi said the awards and honour are a "bonus" for the truthfulness with which she performs her work. "It would be a mistake to work in a film hoping that this is going to give me a national award or an Oscar because then you would not be working with truthfulness. If you are truthful to your work then dividends will flow naturally," she said, adding that this is a lesson she has learnt from her parents, legendary poet Kaifi Azmi and actor Shaukat Kaifi. Having herself vowed audiences across the globe with her stellar performances, Azmi says it is Vidya Balan from the current crop of Indian actors who has impressed her the most with her work. Balan has done five films in a row which are very different from each other, making some very courageous choices, she said adding that Balan's films are those which would not necessarily be embraced by the mainstream cinema. "I watch her work closely and am very impressed with her," she said. Beaming with pride for Farhan and Zoya Akhtar, Azmi was also full of praise for the brother-sister duo and the accolades and awards the two have been receiving for their movies. She said it is not everyday that parents see both their children vying for the award for best director and best film, referring to Farhan's movie Don 2 and Zoya's film Zindagi Na Milegi Dobara, with both being nominated for the Filmfare Award for best Director this year.